Classic knee length mid tan chromed leather coat with a wrap over, asymetric front fastened with concealed buttons and angled map pocket to one side. Belted at the waist with a large flapped pocket in the left side of the 'skirt' and a smaller pocket on the right. That one may originally have been open but a relatively crude/simple flap has been added many years ago, possibly even when in use during the Great war. The jacket collar can be secured at the neck with a buttoned strap whilst the cuffs can be adjusted using press stud fasteners. Lined throughout with a mid tan blanket material. The chromed surface of the coat is rather worn with many areas having a suede-like appearance. Other parts, notably the left arm, have surface peeling and there are numerous small nicks and areas of abrasion. Some seam repairs have been made to the collar but other than that there are no tears or repairs of note. The leather is actually very sound, extremely flexible and generally strong and robust. It is nowhere near as fragile as it might look. It retains the original belt and buckle (leather covering part absent), buttons (a few with damage) and leather hanger. The lining is sound, largely free of moth damage and has only one repaired split. A very nice original set of Royal Flying Corps pilot wings have been stitched to the left breast. Although this practice certainly wasn't in the dress regulations, the wing has clearly been there for some time. 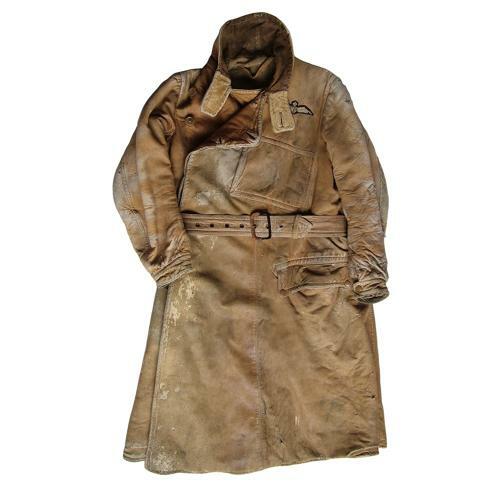 An extremely rare well worn but eminently displayable 100 year old flying coat. More photographs available on request. Stock code J23020.